Today we had the opportunity to speak with Karen Borochowitz, the National Executive Director and Co-Founder of DEMENTIA SA, the leading authority in South Africa on dementia. Over 46 million people in the world are living with dementia today, and by 2050 the number is expected to rise to nearly 132 million. According to Alzheimer’s Disease International, someone in the world develops dementia every THREE seconds. By 2018, the global economic cost of dementia will reach US $1 trillion. What is Dementia and Who Does It Affect? According to Alzheimer’s Association, dementia is not a specific disease, but a term that describes a wide range of symptoms associated with a decline in memory or other thinking skills severe enough to reduce a person’s ability to perform everyday activities. Alzheimer’s disease accounts for 60-80% of cases. Vascular dementia, which occurs after a stroke, is the second most common dementia type. There are many other conditions that can cause symptoms of dementia, including some that are reversible, such as thyroid problems and vitamin deficiencies. Dementia mostly effects people 65 years and older, but is a condition that really impacts the entire family. Alzheimer’s is the only disease among the top 10 causes of death that cannot be prevented, cured or even slowed. In South Africa, dementia impacts many people especially in rural communities, who tend to live longer because of their diet and exercise. Furthermore, people with HIV/AIDS are also more likely to develop dementia. Unfortunately, in South Africa dementia is mostly unrecognized, misunderstood and undiagnosed. It results in further suffering, stigmatization, abuse and neglect. Karen told us the story of a woman (below) who was branded a witch in her community and was saved from a near death after repeated beatings and numerous brutal gang rapes. She was taken to the only old aged home in the Butterworth, a large rural community in the Eastern Cape. Due to space constraints, only 25 residents (men and women) can be accommodated at a time. This woman was at an advanced stage of dementia, but she greeted her visitors with warmth and a smile. 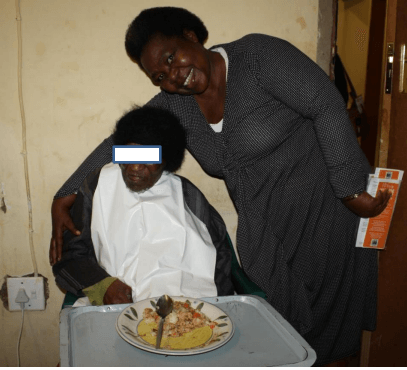 There are so many cases in South Africa like this one, where dementia is so misunderstood and as a result the victims suffer terribly from emotional and physical abuse. In 2006, Karen co-founded DementiaSA, the leading South African authority on all forms of dementia and through its innovative approach to service delivery, strives to minimize the impact that dementia has on individuals, families and communities. For Karen this was a testament to something she personally cared quite a lot about, having taken care of her mother who lived with Alzheimer’s disease for 21 years. In 2014, DementiaSA kicked off a two-year study to better understand who is at risk for dementia. The study revealed very low levels of understanding of dementia, especially among older people, due to lack of literacy, visual impairment, high levels of abuse especially for those showing signs of mental illness. These people are often branded as witches or as being possessed by the ancestors. There is also a misconception that dementia is a white person’s disease. The work in the Eastern Cape was part of a large epidemiological study but DementiaSA wanted to ensure that besides the data for the study, they were able to educate and empower the community about dementia and demonstrate respect and engagement with older people. 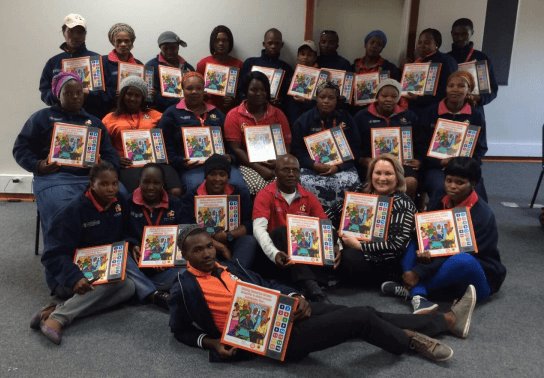 Dementia SA hired and trained 42 Community Health Outreach Workers (CHOWs) to speak with, check and record important vitals and statistics in rural communities. Karen was then thrilled to connect with Zane Wilson, founder of the South African Anxiety and Depression Group, and to learn about the Speaking Book. She believes it was just the right tool to both properly communicate the right information, while also getting trainers and the community excited about learning. With the generous support of the National Lotto, the Dementia Speaking Book was created. The artwork was tested to be culturally appropriate and the script was developed in English and translated in Xhosa. The books were designed to be intergenerational, to be relatable to people of all ages. With three to four generations often living under one roof, it is important to ensure understanding at all levels. The CHOWs were taught how to present the information and how to integrate the Speaking Book in the communities in order to educate and dispel myths around dementia. For Karen, the Speaking Book was a realization of one of her dreams, saying “It’s quite remarkable – wherever we go, people clamor for it – it’s a novelty, and getting a lot of exposure and reach while giving valuable information. DementiaSA is a leading provider of awareness, information, education and support services to all those affected by dementia vigorously advocating the rights and dignity of those living with dementia.